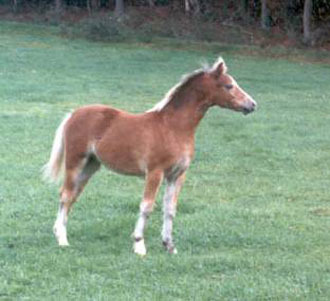 A personal favorite within the stud, Cracker Lass was a consistent prize winner throughout her life. Sadly she was put to sleep in 2001. 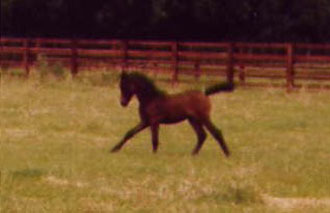 An exquisite 2003 filly foal out of Tamevalley Bo- Peep. She was supposed to come out a colt but with a strength of character she still possesses she was having none of it and came out a filly! 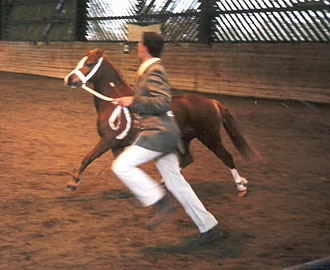 A true show pony with movement and presence to burn. Purchased as a 2yo, Peep is by the nine times WPCS Sire ratings winner Springbourne Caraway. 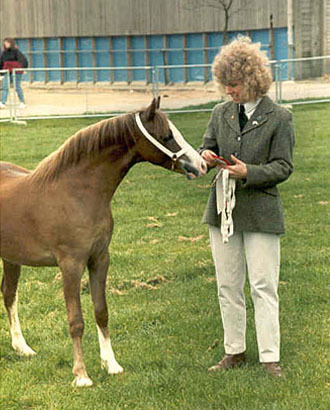 She was only shown once by us due to Foot and Mouth, on this outing she was second at Eastern Welsh Pony and Cob Association show. She bred two fillies for us the first by Maestir Valient and the second, Norash Peek-a-boo by Beau's son Vervale Grenade. Peep was then sold to Amilas Stud for who she produced an incredible colt foal in 2004, Amilas Beau Brummel a full brother to N. Peek a Boo.